Double lancet window in the east wall. 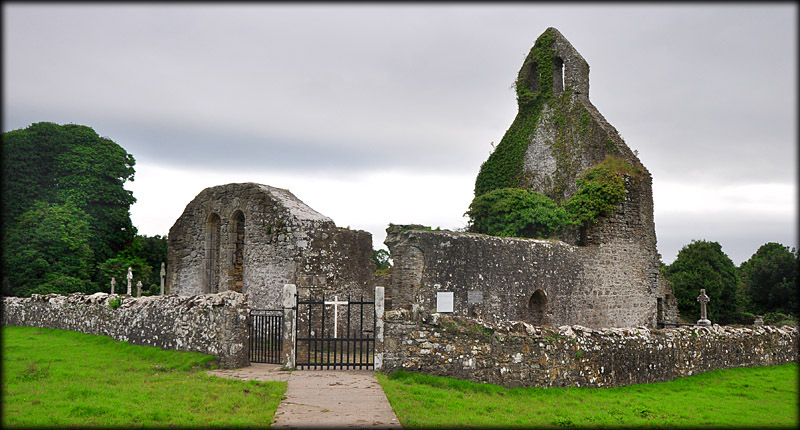 An Abbey was founded in Abbeyshrule in 1200 under the patronage of the O'Farrels of Annaly. It was colonised by Cistercian monks from Mellifont. In 1228 the affiliation changed to Bective Abbey. All that remains today is the ruined rectangular Abbey church, with traces of a cloister garth to the south, the foundations of the Presbytery and evidence of a south transept. The ruin of an ivy clad 16th century residential tower stands in the south east corner of the enclosure. In the 15th/16th century the arch in the central dividing wall was blocked up and three small barrel vaulted chambers were added, see bottom image. A double bellcote was also constructed over the arch. Situated by the roadside to the east of the entrance is a poor replica of an eighth century High Cross that has been removed to the sacristy of the R.C. 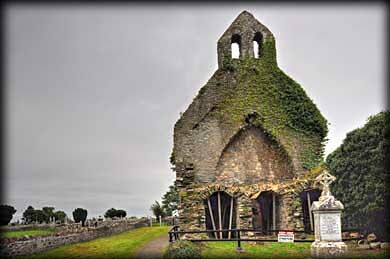 Catholic Church in Abbeyshrule. The cross was originally located in the graveyard next to the abbey. It is an armless sandstone cross with the upper part of the cross expanding outwards. Standing at only 0.97 metres high by 0.27 wide it has been described by Harbison as a thistle-shaped cross. The west face of the shaft, pictured right, is decorated with interlace. The head bears an unusual circular band design that extends on to the upper limb. The North and south sides bear a greek fret design. 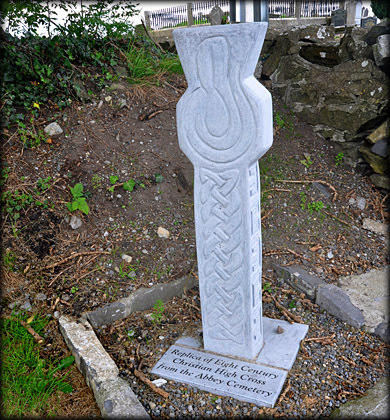 The cross has been compared to the small crosses at Layd in County Antrim and the small cross at Laughanstown in Dublin. We did not know the location of the original cross on this visit but hopefully we will be able to view and photograph the cross on our next visit to Abbeyshrule. It is well worth a wander around the abbey grounds as there are a number of interesting cross slabs present in the graveyard. Situated: From Ballymahon head southeast on the N55. After 4.6 kilometres turn left on to the R392. After 4.7 kilometre you will see the Abbey on your left. Discovery Map 34: N 2264 5893. Last visit Sept 2012.